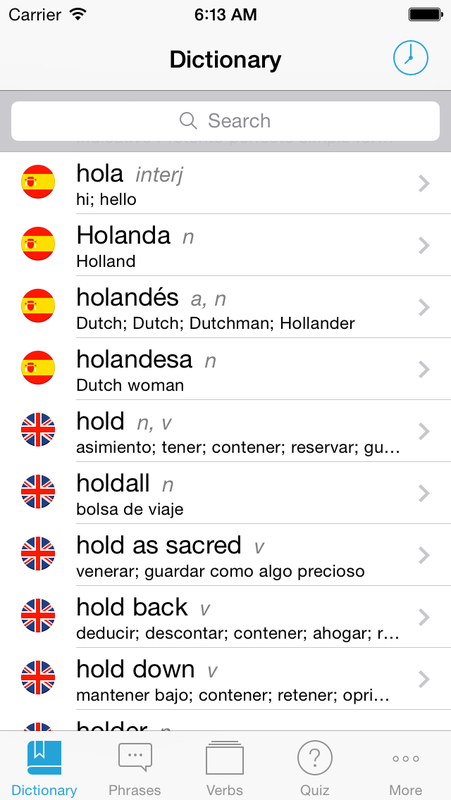 VidaLingua Multilingual Dictionaries for iPhone, iPad and iPod Touch come in Paid and Freemium versions. This User Guide describes paid versions unless otherwise stated. The main features of the Dictionary are available from the toolbar along the bottom of the screen. Additional features and settings are accesible by tapping More on the right of the toolbar, see image below. Versions 6.2 of the German and Portuguese dictionaries include a phrase translator on the toolbar. In these versions, Quiz has been moved to the More tab at the bottom right of the screen. To search for a word, click anywhere in the search bar and a keyboard will appear. Start entering the word you are looking for. The words in the lookup list will reduce to match the search string. Note that you don't have to choose a language before searching for a word. All the words of both languages are in the same list enabling you to find the word you are looking for quickly. To clear the search bar tap on the "x" icon that appears to the right of the search bar. Tap on the History icon at the top right of the screen to see a list of previous lookups. You can delete the entries in the list by tapping Clear in the navbar of the History screen. Words in the lookup list appear with summary entries such as part of speech (n, v, a) and one or more translations. To display all the entries for a word, tap anywhere on the summary row to navigate to the word details screen, see image below. If a word you are looking for is not in the device dictionary, a globe icon will appear in the search field (paid version). Click on the globe to initiate a lookup in several online sources including Wiktionary and Wikipedia. If you want to do an online lookup of a word that is in the dictionary, add a space after the word and the globe icon will appear. Free versions contains approximately 20% of the entries of the paid version. If you are looking for a word that is in the paid version only, a info icon will appear in the search field. Tap on the icon to see a list of words matching your search string that are in the paid version. The dictionary word details screen contains comprehensive information and navbar icons to access additional features. Entries in the top section of the word details screen describe meanings of words to help you understand the translations provided. A brief definition comes first displayed in purple. Part of speech (nouns [n], verb[v], adjective[a], etc.) comes next, displayed in green brackets. Translations of the word appear after the semi-colon and may include further information such as (slang) or geography (UK, LatAmer). The Examples section includes the head word in compound forms or sentences. Examples are given in both languages. For some words you may need to swipe the screen upwards to see all the examples. Tap on a head word, translation or usage example to hear in pronounced. To adjust the speed of the pronunciation or to select an accent (US, Uk, Australian, etc. ), tap on the speaker icon to the right of the navbar. If an image is available for the head word, an icon will appear below the Examples section. You may need to swipe down to see the image icon. Tap on the icon to display the image. Images come from public domain sources, so if you see something that doesn't look right, tap on the Suggest Improvement link at the bottom of the screen to let us know. The Paper Clip icon in the navbar opens a menu which allows you to attach an audio clip, image or annotation to a head word. 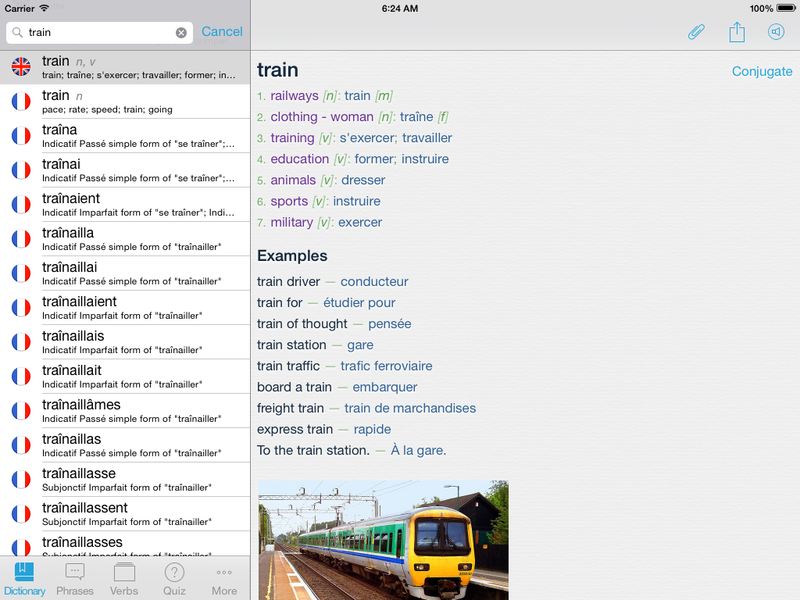 The purpose of these features is to transform the dictionary into an engaging travel companion. For example, you may want to record a person pronouncing a word and attach it to the dictionary entry. Or you might take a picture of an object and attach it to a dictionary entry. In addition, you can add notes to any dictionary entry which could be used to add usage examples for a dialect of the language. The Phrasebook contains commonly used travel phrases organized in twenty categories. To display the phrases in a category, tap on the category name. To find phrases containing a word, enter the word in the search field. You can tap on a phrase in either language to hear it pronounced. To change pronunciation settings such as speed and accent, tap on the speaker icon in the navbar. 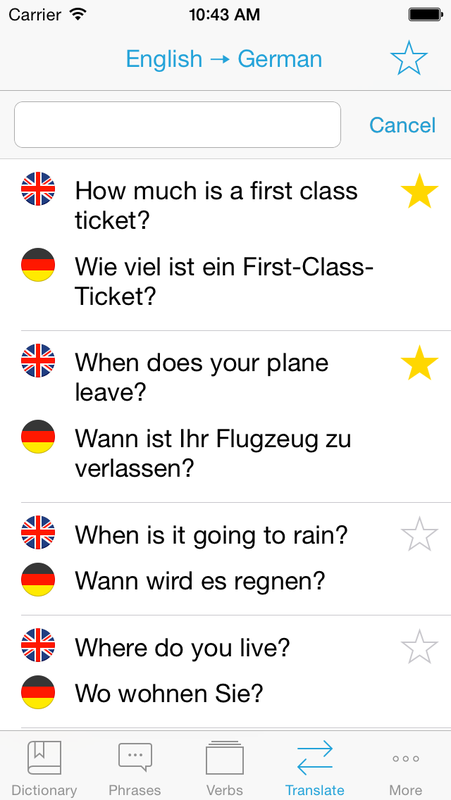 To enter your own phrases into the phrasebook, scroll to the bottom of categories and tap on My Phrases. Then tap on the plus icon in the navbar. Phrases you enter into the phrasebook will be available for pronunciation just like the others. In addition, phrases entered into the phrasebook will appear in the examples section of dictionary words. For example, if you enter a phrase such as "The train is late." it will appear in the examples section of the dictionary page for "train". The verb conjugator displays derived forms of a verb according the person, tense and mood that is being used. Mastering verb conjugation is very important to using a language effectively. Conjugated forms of commonly used verbs (is, am, are) are included in the dictionary and will appear in the lookup list. Tapping on conjugated form will take you to the page for the infinitive form of the verb. A Conjugate link will appear at the top right if complete conjugation tables are available. Tap on Conjugate to take you to the full conjugation screen. 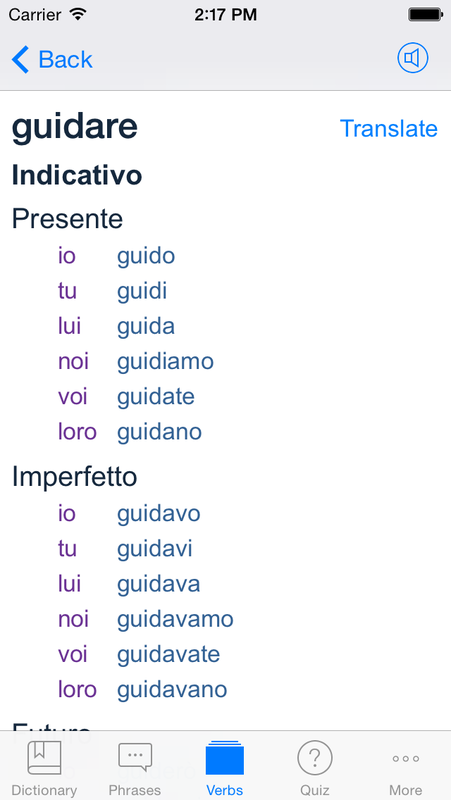 Alternatively, you can look up complete conjugations for thousands of verbs by tapping on Verbs in the toolbar. Tap on the search field and start typing to reduce the list to matching entries. Then tap on the verb to go to the verb conjugation screen. 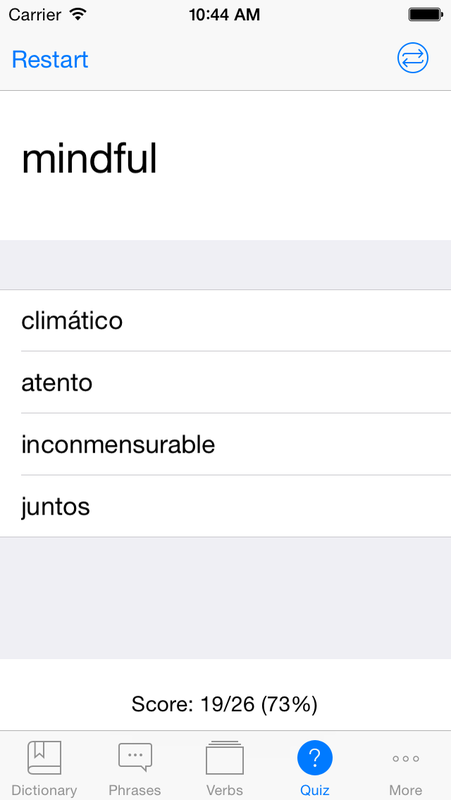 To navigate to the dictionary entry of a verb, tap on Translate in the upper right of the screen. Please note: In version 6.2 of the German and Portuguese dictionaries, the Quiz feature has been moved to the More menu. The quiz feature displays a word in one language and four possible translations in the secondary language. Tap on a translation to see if you chose the right or wrong answer. At the bottom of the screen, your score will appear. To reset your score, tap Restart at the top of the screen. Keep in mind that some words have several meanings and the most commonly used meaning is not always the one chosen for the quiz question. You can change language direction by tapping the arrows icon at the top of the screen. Please note: The Translator is only available in version 6.2 of the German and Portuguese dictionaries at the current time. To access the Translator, tap on Translate in the toolbar. The Translator provides full text translation of sentences from one language to another. The direction of the translation is displayed at the top of the screen English > German. To change direction, simply tap on the language direction indicator. To translate a phrase, enter it in the box at the top of the screen then tap Go in the keyboard. After a few seconds, your phrase and the translation will appear below the entry box. If the phrase you entered and the translated phrase are the same, then try changing translation direction by tapping on the language indicators. The translator requires an internet connection. If the internet is not available, an icon will appear to the right of the phrase. Tap on the icon when internet is available to initiate another translation attempt. You can star a translation to add it to your favorites. 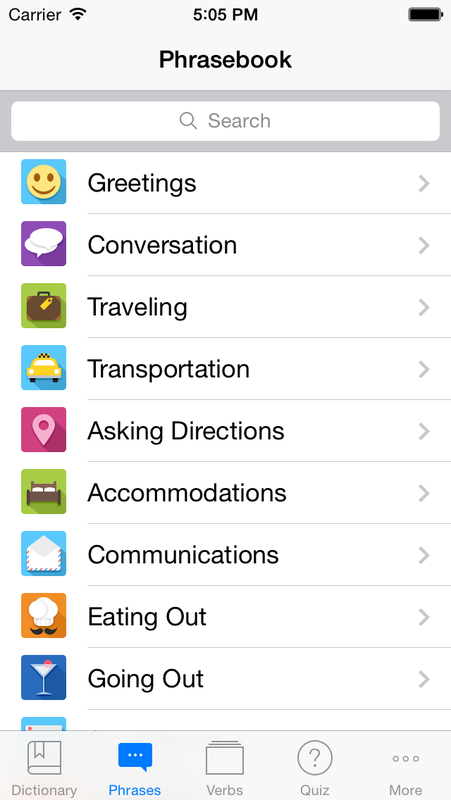 Starring phrases will appear in the My Phrases section of the Phrasebook. To see you favorite phrases, tap on the star icon in the navbar. Once a phrase has been starred, it will appear in the Examples section of appropriate dictionary pages.